We are pleased to announce that West Down came in second place and won the cup at St Giles yesterday at the Devon Major ringing qualifier. We now go to the final at Ashreigney in June. Well done and thanks to Margaret and Fred White, Trevor Sellick and Tonys Jeffery and Barrable. Great team. For hundreds of years the bells of West Down Church have pealed out their message. There is the regular call to Church services, sometimes they peal with joy at a wedding and a muffled peal is rung at funerals and national disasters whilst in November they mark Remembrance Sunday. 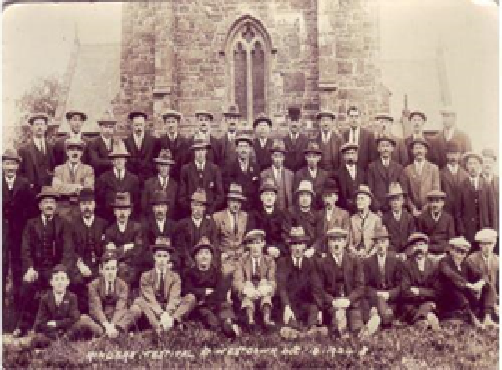 It was recorded in the North Devon Journal of December 1914 “that on Christmas Day the bells were merrily rung at 6 am”. Records show that there were three bells as long ago as 1553 and these survived until the 18th century. In 1794 a licence was granted by Bishop Buller to take down these three bells, two of which were broken. They were then cast into five, as it was not uncommon at that time to recast into a greater number of bells. Number 1. Cast by T Bilbie of Cullompton fecit 1795 and inscribed Rev. P Elston, J Parker and W Challacombe, Church Wardens, 27 1/2 inches diameter. Number 2. as above but 29 1/2 inches diameter. Number 3. Inscribed “God preserve the Church and King” also by T Bilbie with the names James Parker and William Challacombe, Church Wardens, T.B.F.1795, 30 inches diameter. Number 5. Inscribed “I to the Church the living call and to the grave do summon all” names and dates repeated. The diameter is 38 inches. Now to the 6th Bell – this was dedicated in 1879 and was a ‘treble’ given by Mr Anderton of Trimstone. It was cast by Llewellins and James of Bristol. The Bellringers of St Calixtus have over the years an enviable reputation for winning competitions in the art of change-call ringing and have become among the most successful in Devon. From 1957 to 1975 West Down won the Championship 10 times, and were runners-up 7 times, and 3rd twice. West Down won the Shield 3 years running 1962, 1963 and 64. They were the first team to score a hat trick! One not-to-be forgotten event was on May 15th 1954 when Queen Elizabeth and the Duke of Edinburgh returned from their post Coronation Commonwealth tour. A BBC Radio broadcast to celebrate this occasion included the bells of West Down.